Many people wonder how they can become highly successful and significant in their lifetime, not realizing that they hold within them everything they need to achieve all of the success they desire. The Successful and significant people are where they are today because of they have embraced certain pillars in life and they routinely build on those in order to grow daily. 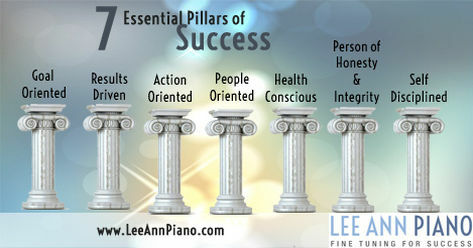 Pillars or habits determine 95% of a person’s behavior. Everything that you are today, and everything that you will ever accomplish, is determined by the quality of the habits that you form. By creating good habits and adopting a positive attitude, you too can become successful and live a prosperous life. For thousands of years, success in human life has been studied by great thinkers and philosophers. I have personally studied the subject for more than 10 years. What I have found is that the very best people have developed really good habits, these are what I call the 7 Essential Pillars of Success. Do you want to AMP UP your life? Then embrace these and you will be amazed at the speed and degree of progress you will begin to make. You need to be a habitual goal setter, and dedicate yourself to working from clear, written goals every day of your life. All highly successful people are intensely goal oriented. They know exactly what they want, they have it written down, they have written plans to accomplish it, and they both review and work on their plans every single day. Becoming results driven is made up of two practices. All really successful people are intensely result-oriented! This is really the most important habit for material success. It is the ability to get on with the job and get it done quickly. It is your ability to develop and maintain a sense of urgency, and a bias for action. Fast tempo in whatever you, not sacrificing quality. This is essential to your success You need to overcome procrastination, push aside your fears and launch 100% toward the achievement of your most important goals. The combination of goal orientation, result orientation and action orientation, in themselves, will virtually assure great success. This is where you put relationships in the center of your life. This is your decision to cultivate within yourself the habits of patience, kindness, compassion, and understanding. Virtually all of your happiness in life will come from your ability to get along well with other people! The good news is that you can become a wonderful human being in your relationships with others when you simply make a choice to do so. As Aristotle said, the only way that you can learn any habit is by practicing it on a regular basis. The more you practice being a truly excellent person in your relationships with others, the more you will internalize those qualities and actually become that person. This means that you must consistently and carefully watch your diet, and always eat the right foods in the right portions. You must exercise on a regular basis, continually using every muscle and joint of your body to keep it limber and fit. And finally, you must have good habits of rest and recreation that will enable you, in combination with diet and exercise, to live out your years in a healthy state. Remember, your health is the most important single thing you have, and it is completely subject to the habits that you develop with regard to the way you live. In the final analysis, the character you develop as you go through life is more important than virtually anything else. Your reputation is everything! Honesty means that you practice the reality principle in everything you do. You are completely objective with yourself and with the world around you. You set very clear values for yourself and you organize yourself around your values. You develop a vision for yourself and then you live your life consistent with your highest ideals. You never compromise your integrity or peace of mind for anyone or anything. Your ability to discipline yourself, to master yourself, to control yourself, is the most important single quality that you can develop as a person. The habit of self-discipline goes hand in hand with success in every area of life. Every one of these habits, being goal oriented, results driven, action orientated, people orientated, health conscious, honest and self-disciplined can be developed. You are where you are and what you are today because of your habits. Your habits have been developing, mostly accidentally from the time you were an infant. Today you can take complete control over the shaping of your character and personality, and everything that happens to you in the future, by making the decision, right now, to define and develop the habits (pillars) that will lead you to great success. Your future is full of unlimited potential! Previous PostPrevious Keep Growing In Order To Keep Going!